Cameron Mackintosh's acclaimed production of Alain Boublil and Claude-Michel Schonberg's Tony Award-winning musical phenomenon, LES MISERABLES, will return for its much anticipated Chicago engagement at Broadway In Chicago's Cadillac Palace Theatre (151 W Randolph) July 9-27, 2019, direct from a celebrated two-and-a-half year Broadway engagement. With glorious new staging and dazzlingly reimagined scenery inspired by the paintings of Victor Hugo, this breathtaking production of LES MISERABLES, which broke box office records during its pre-Broadway tour, has left both audiences and critics awestruck, cheering "Les Miz is born again!" (NY1). Cameron Mackintosh said, "I'm delighted that after a four-year absence this glorious production is once again touring the major cities across North America and is more spectacular than ever." Set against the backdrop of 19th-century France, LES MISERABLES tells an enthralling story of broken dreams and unrequited love, passion, sacrifice and redemption - a timeless testament to the survival of the human spirit. Featuring one of the greatest scores of all time, with thrilling and beloved songs including "I Dreamed A Dream," "On My Own," "Stars," "Bring Him Home," "One Day More," "Do You Hear the People Sing" and many more, this epic and uplifting story has become one of the most celebrated musicals in theatrical history. Along with the Oscar-winning movie version, it has now been seen by more than 130 million people in 44 countries and in 22 languages around the globe. 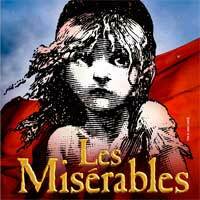 LES MISERABLES is still the world's most popular musical, breaking box office records everywhere in its 33rd year. Cameron Mackintosh's production of Boublil and Schonberg's LES MISERABLES has music by Claude-Michel Schonberg, lyrics by Herbert Kretzmer from the original French text by Alain Boublil and Jean-Marc Natel, additional material by James Fenton and original adaptation by Trevor Nunn and John Caird. The original LES MISERABLES orchestrations are by John Cameron with new orchestrations by Christopher Jahnke, Stephen Metcalfe and Stephen Brooker. The production is directed by Laurence Connor and James Powell, designed by Matt Kinley inspired by the paintings of Victor Hugo with costumes by Andreane Neofitou and Christine Rowland, lighting by Paule Constable, sound by Mick Potter, musical staging by Michael Ashcroft and Geoffrey Garratt and projections by Fifty-Nine Productions. Music Supervision is by Stephen Brooker and James Moore, with casting by Kaitlin Shaw for Tara Rubin Casting.